The crazies will believe that he and the brothers were framed by the police. This guy probably caused some additional deaths somewhere by stirring up some nutty people. He should go to jail for a while because this is the ultimate hate crime. Olabinjo “Ola” Osundairo and Abimbola “Abel” Osundairo filed each filed for bankruptcy in Chicago back in September 2016. Abel claimed he had $72,771 in liabilities, including $39,000 in student loans. The bodybuilder stated he only made $142 per month from “odd jobs,” which left him over $300 in the hole each month. Ola claimed his debt had soared to $161,481, including $85,000 in student loans. Ola, who is an aspiring rapper and appeared on “Empire,” listed his income at $160 per month. This is about par for the course in today's racist USA. The bros had to rack up huge (160K) debts just to get an educcation, and now get subminimal wage for odd jobs. With rising costs in Chicago, how can they hope to survive? Yet the rich fatcats roll on like usual, thanks to their political connections. Looks like they got time to lift weights, though. Nobody other than Smollett, the two brothers, and the police have any reason to believe they know what happened at this point. We are likely going to have to wait weeks or months for anything resembling a conclusion if we ever get a conclusion at all. No one will care by then. this would be the perfect time for some red hat wearing thugs to actually attack him. Sure, there are hoaxes, but don't pretend that white people don't utter racial slurs in person, online, in graffiti, and attack black people. Here on this site alone, we see numerous racial slurs on a daily basis. Look at any online comments after an article that has to do with African Americans. Half the incidents you cite are clearly hoaxes with either political agendas or some sort of criminal subterfuge behind them (like the guy who stole church money for crack), but the other half you cite don't identify any motive. You're speculating that these other crimes are most likely politically inspired, but they could just as easily be perpetrated by black Nazi sympathizers or whatever. There's no particular reason why out of the 40+ million black people in the U.S. that there wouldn't be a few, or a few dozen, Nazis crazy enough to do these things. I just started paying attention to Juicy's story yesterday because I don't really have time for this crappola. Anyway, I haven't found one black media outlet that takes gay Tupac seriously. Everyone clowns him and asks the basic questions anybody with firing neurons would ask about this stupid story of his. I know Kamala Harris and Jada came out on his side when the news first broke, but that was before he revealed how ludicrous he is. Now nobody will go near his defense. Robin Roberts plainly didn't care for his b.s. I just want to know what diabolical person put this idiot up to this stunt. Was it the Nigerian bodybuilder scammers? (By the way, if those two dudes assaulted Juicy, he'd be drinking his dinner from a straw.) Was it Lee Daniels? Was it Al Sharpton? Was it Trump??? LOL. Of course this is the case. I'm black and have experienced various racist incidents online and in person. But no white guy in a ski mask and M-AGA hat is going to track me down in Oakland at 2AM and put a noose around my damn neck. I'm about the same size as Juicy Smalls there and all bundled up for winter weather, you can't tell if I'm 170 or 200 lbs. You can't tell if I'm armed or not-- and why wouldn't I be at that hour? They'd be too afraid of getting shot, beaten up, killed, or that other black people might see them and do all that to them. Juicy's story is especially despicable to me because I actually had someone I knew well killed in this manner. Yes, the police caught the murderer, investigated and the guy was convicted of a hate crime. So this fraudulent actor irritates me. Can't wait to see him charged with the crime he's committing against the people of Chicago and possibly these two Nigerians (unless they're in on it as well). More blacks killed by other blacks in one year in Chicago than lynchings in the south in past 100 years. Democrat media (New York Times, Washington post, etc.) refusing to cover the smullet attack hoax. Looks like nagoya is right about the hoax (so far! ), but nagoya is a racist to call anyone crazy for believing it. Be careful who your enemies are nagoya, you’ll end up just like them. Thanks for impersonating me, by the way. A million stupid trolls won’t get you a trans-Canada record. 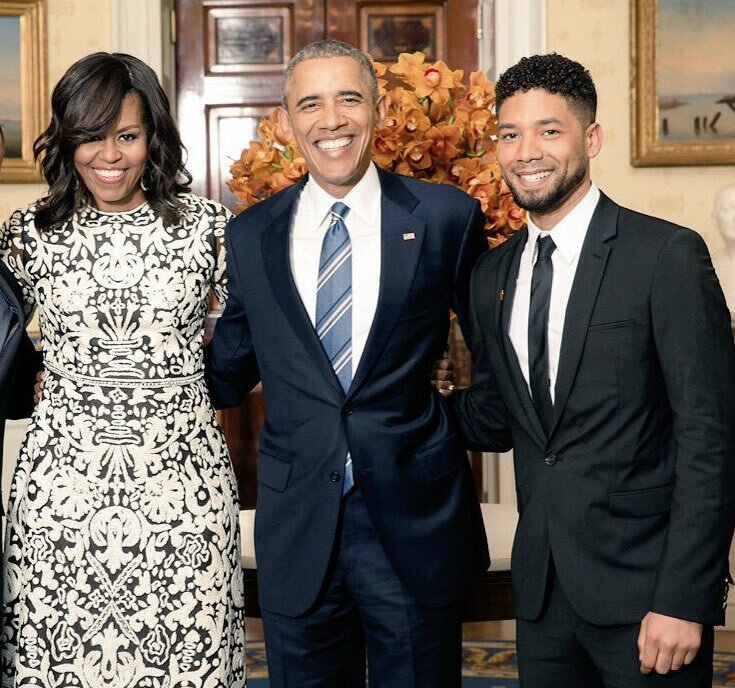 I'm thinking Jussie not really smart enough to come up this himself. Who's the Svengali behind it all? "Credible" meaning "believable by shills" maybe? Empire Staff are still standing strong with JS! It's the details like this that keep rolling in that make this story a must-follow.